WAITE: Gain, riches; family matters, archives, extraction, the abode of a family. Additional Meanings: Represents house or dwelling, and derives its value from other cards. Reversed: An occasion which may be fortunate or otherwise. Reversed: Chance, fatality, loss, robbery, games of hazard; sometimes gift, dowry, pension. MATHERS: House, Dwelling, Habitation, Family. Reversed: Gambling, Dissipation, Robbery, Loss. ETTEILLA: House, Household, Economy, Savings.Dwelling, Domicile, Residence, Manor, Abode, Regiment, Ship, Vessel, Bowl.Archives, Castle, Cottage.Family, Extraction, Race, Posterity.Den, Cavern, Lair. Reversed: Lot, Fortune, Gambling, Fortunate Situation, Fate, Ignorance, Chance, Destiny, Destined, Inevitability.Fortunate or Unfortunate Occasion. WAITE: Prudence, safety, success, accomplishment, certitude, discernment. Additional Meanings: Prompt fulfillment of what is presaged by neighbouring cards. Reversed: Roguery, deception, voided project, bad faith. Additional Meanings: Vain hopes. MATHERS: Discretion, Circumspection, Prudence, Discernment. Reversed: Deceit, Bad faith, Artifices, Deception. ETTEILLA: Result, Achievement, True [Real], Accomplishment, Success. Reversed: Artifice, Fraud, Deception, Broken Promises, Empty Experiences, Aborted [Failed] Projects. WAITE: Work, employment, commission, craftsmanship, skill in craft and business, perhaps in the preparatory stage. Additional Meanings: A young man in business who has relations with the Querent; a dark girl. Reversed: Voided ambition, vanity, cupidity, exaction, usury. It may also signify the possession of skill, in the sense of the ingenious mind turned to cunning and intrigue. Additional Meanings: The Querent will be compromised in a matter of money-lending. Reversed: Flattery, Usury, Hypocrisy, Shifty. ETTEILLA: A Dark Girl, Passive, Great Night. Reversed. Lack of [Voided] Ambition, Avarice, Usury. Illustration (above): Eight of Coins from Tarocco Soprafino di F. Gumppenberg (1835), republished by Il Meneghello. Click the image for a larger one. WAITE: These are exceedingly contradictory; in the main; it is a card of money, business, barter; but one reading gives altercation, quarreland another innocence, ingenuity, purgation. Additional Meanings: Improved position for a ladys future husband. Reversed: Cause for anxiety regarding money which it may be proposed to lend. Additional Meanings: Impatience, apprehension, suspicion. MATHERS: Money, Finance, Treasure, Gain, Profit. Reversed: Disturbance, Worry, Anxiety, Melancholy. ETTEILLA: Money, Wealth, Sum, Silver.Silverware.Whiteness, Purity, Naïveté, Innocence, Artlessness [Ingenuity], Moon.Purgation, Purification. Reversed: Anxiety [Agitation], Mental Torment, Impatience, Trouble, Despondent, Worry, Concern, Care, Attention, Diligence, Applying Yourself.Apprehension, Fear, Distrust, Mistrust, Suspicion. WAITE: Presents, gifts, gratification; another account says attention, vigilance; now is the accepted time, present prosperity, etc. Additional Meanings: The present must not be relied on. Reversed: Desire, cupidity, envy, jealousy, illusion. Additional Meanings: A check on the Querents ambition. Reversed: Ambition, Desire, Passion, Aim, Longing. ETTEILLA: The Present, At the Moment, Presently, Now, Forthwith, Suddenly, Instantly, At This Time, Today, Assistant, Witness, Contemporary.Attentive, Careful, Vigilant. Reversed: Desire, Wish, Ardor, Overzealousness, Passion, Affectations, Cupidity, Envy, Jealousy, Illusion. WAITE: The card foretells material trouble above all, whether in the form illustrated [see illustration, left]that is, destitutionor otherwise. For some cartomancists, it is a card of love and loverswife, husband, friend, mistress; also concordance, affinities. These alternatives cannot be harmonized. Additional Meanings: Conquest of Fortune by Reason. Reversed: Disorder, chaos, ruin, discord, profligacy. Additional meanings: Troubles in love. MATHERS: Lover or Mistress, Love, Sweetness, Affection, Pure and Chaste Love. Reversed: Disgraceful Love, Imprudence, License, Profligacy. ETTEILLA: Lover, Person In Love, Chivalrous Man [Galant], Refined Woman [Galante], Husband, Wife, Spouse, Friend. Paramour, Mistress.Love, Cherish, Adore.Harmony, Accord, Suitable Character, Presentable, Decorum. Reversed: Muddled, Disorganization.Debauchery, Disorder, Trouble, Confusion, Chaos.Damage, Ravage, Ruin.Dissipation, Wasting [Consomption, therefore also Tuberculosis? ].Dissoluteness, Licentiousness.Discord, Disharmony, Conflict. 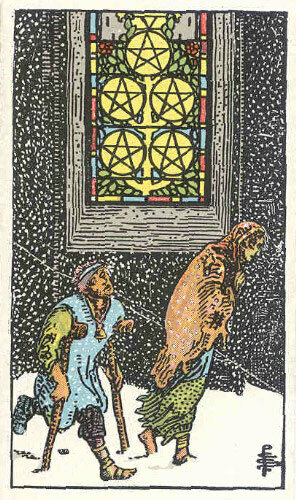 llustration (above): Five of Pentacles, from an early edition (c. 1910) of The Rider Tarot Deck by Waite & Smith, first published by Rider in 1909 (from the private collection of Holly Voley). Click the image for a larger one. WAITE: The surety of possessions, cleaving to that which one has, gift, legacy, inheritance. Additional Meanings: For a bachelor, pleasant news from a lady. Reversed: Suspense, delay, opposition. Additional Meanings: Observation, hindrances. MATHERS: Pleasure, Gaiety, Enjoyment, Satisfaction. 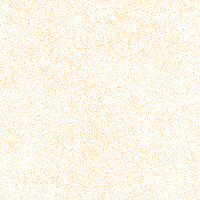 ETTEILLA: Charity, Present, Gift, Generosity, Liberality, Childs Holiday Gift, Favor, Offering, Donation, Bonus, Assistance.The Color White, Lunar Medicine, Pierrot [Pierre au blanc]. Reversed: Enclosure, Circuit, Convolution, District, Circumference, Circle, Circulation.Intercept, Obstruction, Blocking, Cornering, Cloister, Monastery, Convent.Immutable, Fixed, Determined, Definitive, Extremity, Borders, Limits, Bounds, End, Barrier, Partition, Outdoor Wall, Hedge, Interior Wall.Obstacles, Hindrances, Difficulty, Suspense, Delay, Opposition. WAITE: Métier, trade, skilled labour; usually, however, regarded as a card of nobility, aristocracy, renown, glory. Additional Meanings: If for a man, celebrity for his eldest son. Reversed: Mediocrity, in work and otherwise, puerility, pettiness, weakness. Additional Meanings: Depends on neighbouring cards. MATHERS: Nobility, Elevation, Dignity, Rank, Power. Reversed: Children, Sons, Daughters, Youths, Commencement. ETTEILLA: Important, Noble, Consequential, Celebrated, Big, Great, Extensive, Enormous, Magnificent, Renowned, Famous, Powerful, Lofty [Elevated], Illustrious.Illustration, Esteem, Grandeur of Soul, Nobility of Conduct, Acts of Generosity, Magnificently, Splendidly. Reversed: Puerility, Childhood, Childishness, Frivolity.Weakening, Debasing, Reduction, Courteousness, Lowness, Mediocrity, Trifle, Trinket, Servility, Weakness, Child, Infant, Puerile, Puny, Low, Grovelling, Lowly, Contemptible, Humble.Abjection, Humility, Humiliation. WAITE: On the one hand it is represented as a card of gaiety, recreation and its connexions, which is the subject of the design [see illustration, left]; but it is read also as news and messages in writing, as obstacles, agitation, trouble, embroilment. Additional Meanings: Troubles are more imaginary than real. Reversed: Enforced gaiety, simulated enjoyment, literal sense, handwriting, composition, letters of exchange. Additional Meanings: Bad omen, ignorance, injustice. Reversed: Letter, Missive, Epistle, Message. ETTEILLA: Embarrassment, Obstacle, Engagement, Obstruction, Tear, Snag.Trouble, Upset, Emotion, Awkward Position, Confusion [Embroilment], Difficulty, Unexpected Obstacle, In Error, Obscurity.Agitation, Anxiety, Perplexity, Concern. Reversed: Note, Written Document, Handwriting, Text, Literature, Doctrine, Erudition, Written Work, Book, Production, Composition, Dispatch, Epistle, Missive.Written Character.Literal SenseAlphabet, Elements, Principles, Bill [Letter] of Exchange. 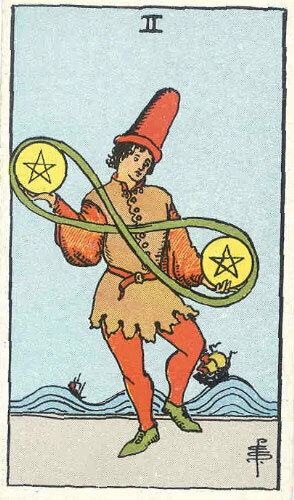 llustration (above): Two of Pentacles, from an early edition (c. 1910) of The Rider Tarot Deck by Waite & Smith, first published by Rider in 1909 (from the private collection of Holly Voley). Click the image for a larger one. WAITE: Perfect contentment, felicity, ecstasy; also speedy intelligence; gold. Additional Meanings: The most favourable of all cards. Reversed: The evil side of wealth, bad intelligence; also great riches. In any case it shews prosperity, comfortable material conditions, but whether these are of advantage to the possessor will depend on whether the card is reversed or not. Additional Meanings: A share in the finding of treasure. MATHERS: Perfect Contentment, Felicity, Prosperity, Triumph. Reversed: Purse of Gold, Money, Gain, Help, Profit, Riches. ETTEILLA: Perfect Contentment, Felicity, Happiness, Rapture, Enchantment, Ecstasy, Marvel, Complete Satisfaction, Complete Joy, Inexpressible Pleasure, Color Red, Perfect Medicine, Solar Medicine, Pure, Accomplishment. Reversed: Sum, Capital, Principal.Treasure, Wealth, Opulence.Exceptional, Dear, Precious, Inestimable.